Prepare the popcorn as per the directions on the pack, and set it aside. Line a tray with some baking paper ready for use later. 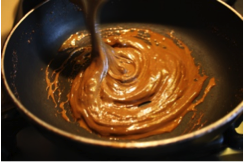 In a small non-stick frypan, place the coconut sugar and heat the sugar until it melts, stirring constantly with a wooden spoon. Stay with it as it won’t take long (about 1 minute). I have included a photo so you can see the colour it will turn and how it should look when it’s time to take it off the heat. At this point, remove from heat and stir through the butter, taking care not to touch the mixture as it will burn you. Place some of the popcorn, about 3 handfuls, on the tray and spoon the toffee mixture evenly over it. Add more popcorn on top and mix it through. You’ll have to work quickly as the mixture will set fast. Leave for a minute or so before breaking the popcorn coated toffee clumps up into pieces. 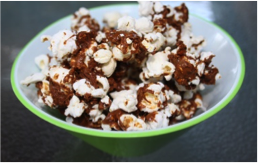 You could repeat the whole toffee process with any remaining popcorn, or just eat it with a sprinkle of Himalayan salt.